It is quite evident that most of the map is dotted with high popularity of Laravel. The magnanimous leap of laravel in comparison to CodeIgniter, Zend, YII, and CakePHP over past 12 months speaks volume about it undisputed popularity as the best PHP framework in 2018. 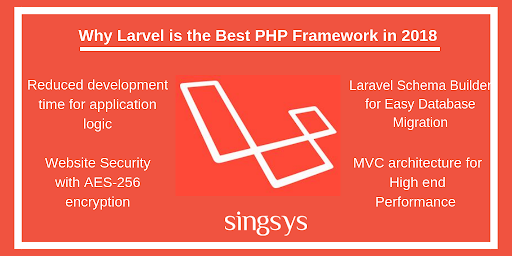 Laravel is one of the most flexible and effective platform for best in class web application development based on symphony and follow the MVC architecture pattern. The above statement is justified by the fact that hundreds of Health, Media, Tourism and Education websites are based on laravel. The reason behind the success of these websites in their niche is ability of laravel to support complex web applications that requires different type of user login, features and user interfaces. Developers spend a lot of time to write authentication code. The latest stable update, Laravel 5.7 comes with validation code pre built in it. This code has significantly reduced the amount of development time for application logic. Using laravel developers can develop authentication logic be it for a small website or for a really large e-commerce website requiring authentication for multiple user types. Artisan is an awesome inbuilt tool that ensure the interaction of developer with Laravel framework will be as minimal as possible as most of the time taking repetitive programming tasks need not to be performed manually. Basically using artisan Laravel developers can develop a skeleton code along with a database structure so database can be managed smoothly and quickly. Another benefit of Artisan(Extended Symfony console) is creation of commands to do tasks easily as well as do the unit tests of the web application. Laravel developer can expand database structure of the web application without having to recreate whenever a change is made and in this way the chances of losing the data is truly zero. Using Laravel Schema Builder it is possible to create tables as well as insert columns in database and it act as a version control of the database. 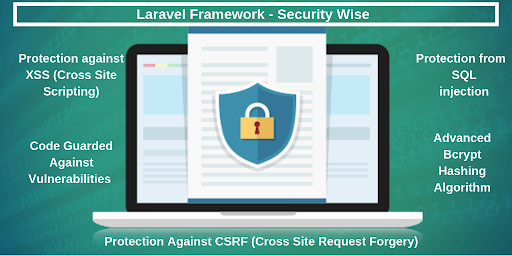 Unlike WordPress, Laravel ensures high end security of the website. Only authorised users can access the data owing to its default AES-256 encryption on passwords. The password is never stored in database in form of plain text due to use of salted and hashed password rather Bcrypt hashing algo is implemented to encrypt the password. Laravel is very serious on security front as it use SQL statements that eliminates any scene of SQL injection attack completely. It is on of those features that is missing from most of the other PHP frameworks. Among so many pre-installed and object oriented libraries Authentication Library is one such useful library. These libraries are easy to implement and have features like CSRF protection, Bcrypt hashing, encryption, checking active users and password reset. Laravel’s ability to support MVC architecture Symfony results in development of logic and presentation layers with lot of transparency between the both. Complete support from MVC helps in boosting the website performance wise and is also useful in good documentation owing to its multiple high-end inbuilt features. A quick snapshot of what makes laravel most preferred choice of programmers in terms of PHP frameworks. If you are convinced with the way laravel has captured the attention of web app developers and want to get a custom built website for business on laravel then hire dedicated developers based on these flexible engagement models. Get in touch with us and our representative will provide you rest of the details.